In its bohemian heyday of the 19th century, Montmartre became the home of Henri de Toulouse-Lautrec for the whole of his adult life. 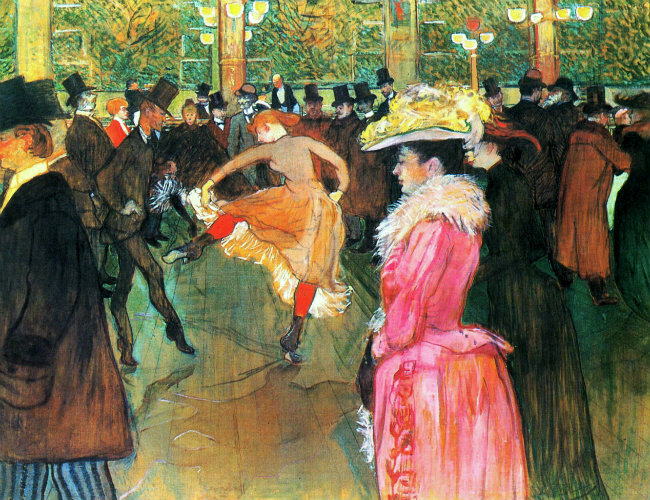 No other artist identified with Montmartre like Toulouse-Lautrec. 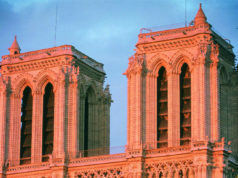 He became synonymous with this Parisian village, the epitome of life there. He was not just an artist impersonally depicting what he saw in the neighborhood’s whore houses and cabarets, but Toulouse-Lautrec loved his subjects, lived amongst them, with them and painted them without judgement and with a genuine affection that is evident in his paintings of this period. Perhaps Toulouse-Lautrec’s stunted growth helped him to identify and be comfortable with outsiders, the underclass of society, because his background before he came to Paris was the antithesis of life in one of the poorest working class areas in Paris. 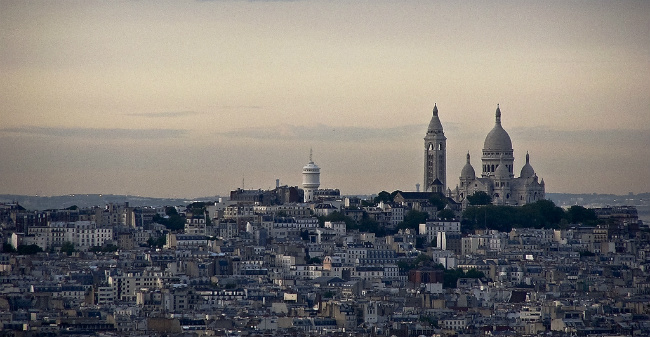 Perched on a butte high above Paris, Montmartre had escaped the renovations of Haussmann. Under Napoleon III, from 1853 to 1870, the demolition of crowded, unhealthy and medieval neighbourhoods made way for wide, grand avenues, parks and squares. Montmartre was annexed along with 10 other suburbs, increasing the number of arrondissements from 12 to 20. This annexation– from the more bourgeois areas of central Paris– helped turn Montmartre (with its cheap rents!) 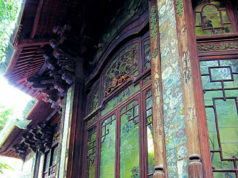 into a haven for avant-garde artists. It also morphed into a (somewhat tawdry) entertainment quartier with cabarets, circuses, dance halls and, last but not least, brothels. The winding, narrow streets still dotted with working windmills all escaped Haussmann’s master plan and the licentious and often bawdy, culture which permeated these haphazard rues attracted Parisians from all walks of life. Henri de Toulouse-Lautrec was no exception. Henri moved to Paris with his mother when he was eight years old. He was already painting and drawing, in particular horses which were his passion and he later made use of this skill in his circus drawings. Henri had never been a healthy child and when he fractured his right femur at aged 13 and then his left a year later, his legs ceased to grow any more although his trunk developed normally. Henri’s adult height was never to increase more than 1.42m (4’ 8”). His first introduction to Montmartre was when he studied under the acclaimed portrait painter Léon Bonnat. 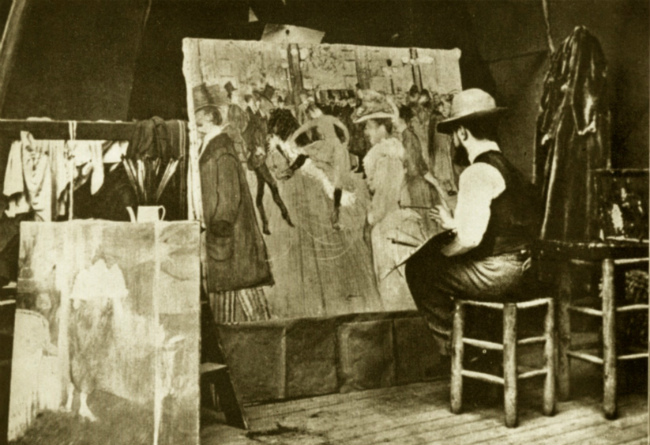 Henri de Toulouse-Lautrec was not to leave Montmartre for the next 20 years. He also studied with other young artists under Fernand Cormon in Cormon’s atelier school in Rue Coustance. For a while he lived in 19, bis Rue de Fontaine with René Grenier and Lily Grenier (who was a model for Degas who lived in the same building.) From there in 1887 Toulouse-Lautrec moved into 27, Rue de Coulaincourt with Dr Henri Bourges, a childhood friend where he stayed until 1893. Toulouse-Lautrec continued to move around Montmartre, at one time sharing a studio with Suzanne Volquin in Rue Tourlagne. In 1881 entrepreneur and artist, Rodolphe Salis opened Le Chat Noir night club. 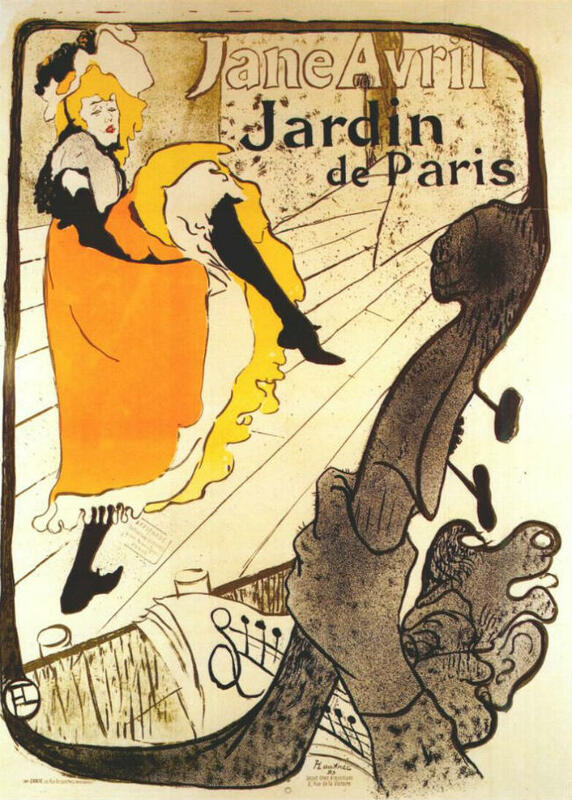 The innovation of lithographs made possible publicity posters and Toulouse-Lautrec’s lithograph, Moulin Rouge-La Goulue, made him an overnight sensation in Montmartre. Likewise in 1892, the iconic poster, Aristide Bruant dans son cabaret Ambassadeurs– depicting Bruant with the now iconic red scarf and black hat– could only be Henri de Toulouse-Lautrec’s inimitable work. Although friends with Van Gogh and Emile Bernard, Toulouse-Lautrec was influenced by the fluid paintings of Degas, especially his dancers, and also with the work of Manet. Henri de Toulouse-Lautrec had begun painting prostitutes, depicting some of their lesbian relationships with both humanity and sensitivity, never censure or sensationalism. He was fascinated by their lifestyle, spending more and time with them, observing them at rest, bathing, combing their hair, putting on make-up and dressing. Like them, because of his stature, Toulouse-Lautrec could identify with the prostitutes’ outsider status. 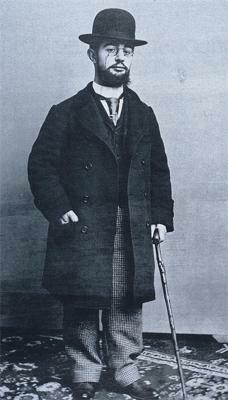 Mockery of his height was perhaps the deciding factor that drove Henri de Toulouse-Lautrec to drink. 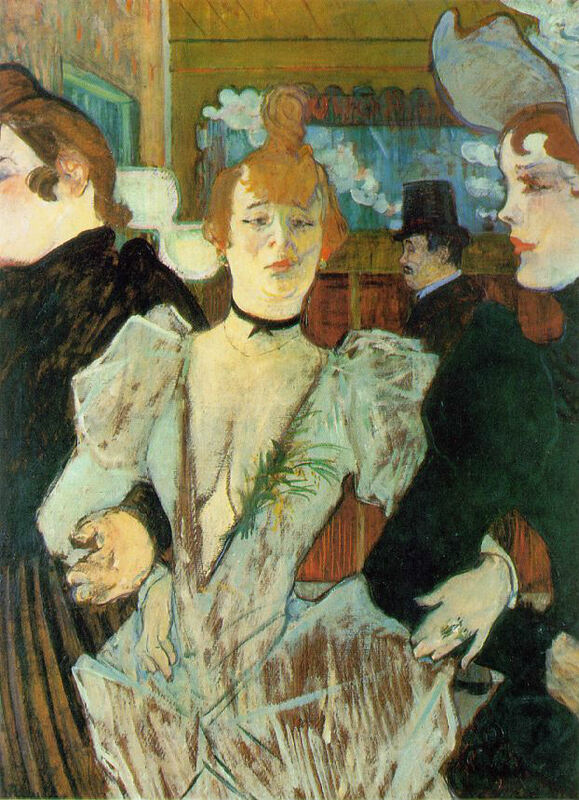 Moving on from beer and wine to absinthe, or the lethal, ‘Tremblement de Terre’-a vicious mix of brandy and absinthe, Henri de Toulouse-Lautrec’s dependency on alcohol was such that he hollowed out his cane to make sure he was never without. 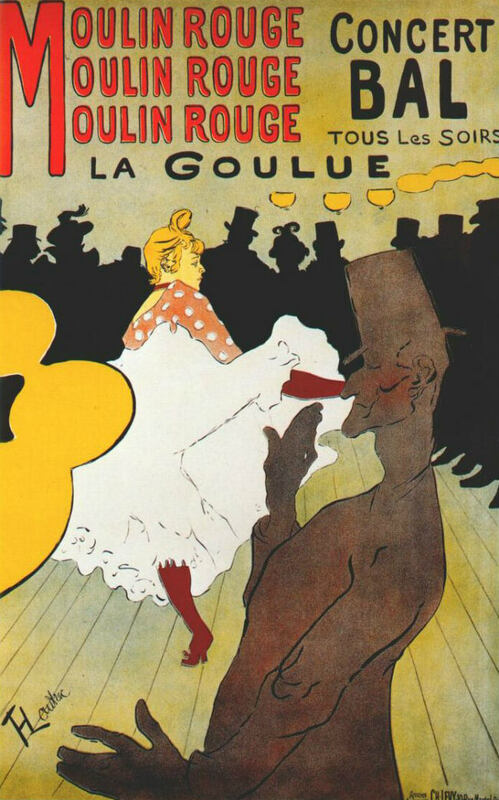 When the Moulin Rouge opened at 82 Blvd Clichy, Toulouse-Lautrec was commissioned to do a series of posters, perhaps some of his most iconic works. His paintings of the singer Yvette Guilbert, La Goulue (the outrageous dancer), Louise Weber and Jane Avril assured him a reserved front seat at the cabaret, where he revelled in painting the gentlemen in their top hats, ‘slumming it’ in the audience. In 1899 Toulouse-Lautrec’s alcoholism caused him to collapse and his mother had him committed to the Folie Saint James sanatorium in Neuilly for three months. He drew throughout his time there, producing 39 circus portraits. Back in Montmartre, Toulouse-Lautrec’s health continued to decline, syphilis and alcoholism weakening his already ravaged health. He continued painting and drawing for another two years before his body finally gave up. Henri de Toulouse-Lautrec died on September 9th, 1901 at the age of 36, in Albi with his mother beside him. 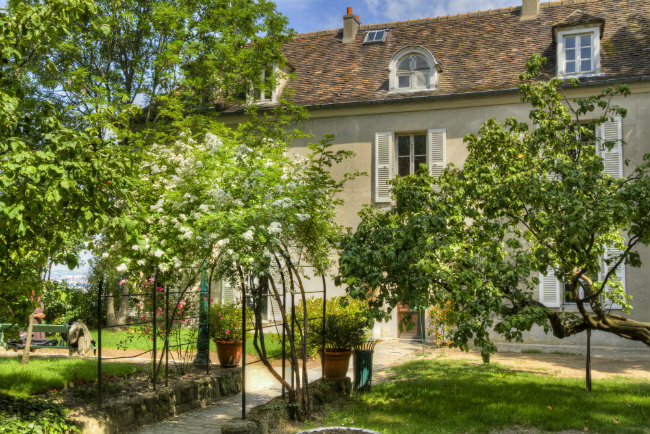 Some of his paintings can be found in the Orsay museum but to get a real flavor of Henri de Toulouse-Lautrec’s Montmartre, the Musée de Montmartre gives an invaluable insight into the quarter and its many famous occupants. 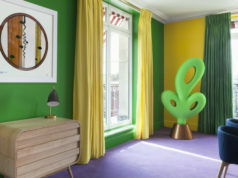 Jean de Brunhoff and his Unforgettable Elephant – BABAR!